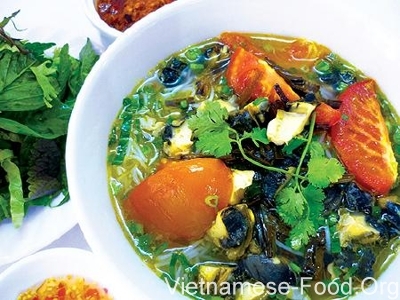 2 kg medium-sized edible snails,1 kg pork bones,0.5 kg tomatoes,0.5 lettuce, 0.5 kg herbs, 200g green onion, 10g coriander, 10g perilla, 30ml thickened vinegar, 10g salt, 5g sugar. Snails are washed,hard- boiled, the meat and the meat is taken out th shell. Pork bones are stewed in 90 minutes.To cut the tomato into slices of equal thickness. 50g green onion, coriander, perilla are cut into pieces. 150g green onion cut into pieces 2cm . To cook soups: broth from bone +broth from snail + thickened vinegar+ sugar + salt. Your blog about Vietnamese Cuisine food is really awesome and this food looks delicious .I like Vietnamese cuisine food very much and i have tried many vietnamese recipes which i got from youtube and many other website. I like visiting Vietnamese restaurants in weekend.